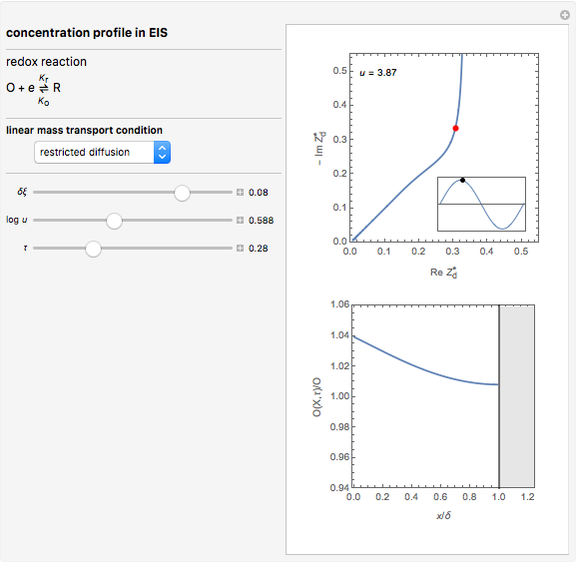 This Demonstration models the time dependence of the concentration profile for the soluble species involved in a reversible electron transfer reaction , taking place at the surface of a planar macroelectrode. 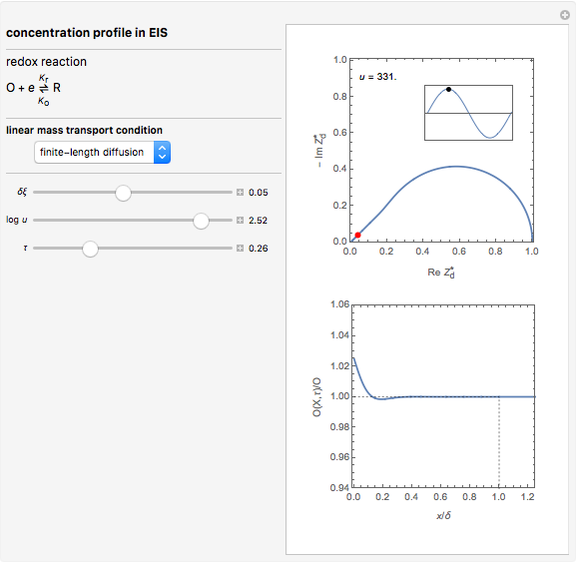 The electrode potential is treated as a sinusoidal perturbation. The model assumes finite diffusion in the electrolyte, with a permeable or impermeable boundary condition at the distance from the electrode surface (the so-called finite-length diffusion or restricted diffusion), respectively. 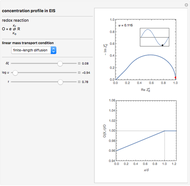 You can experiment with the effects of the amplitude of sinusoidal perturbation, the decimal logarithm of its frequency and the time variable, using the controls for the dimensionless parameters , and , respectively. 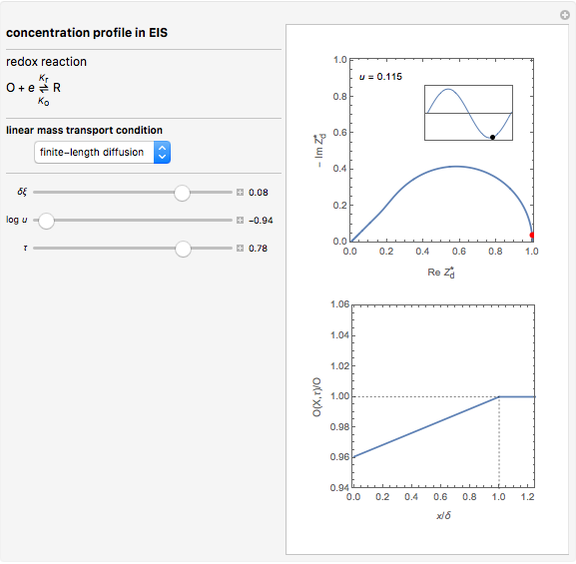 This Demonstration shows on the dimensionless concentration profile for the species involved in the electron transfer reaction . 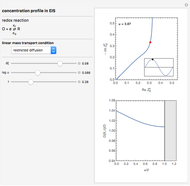 The perturbation signal is a sinusoidal variation of the electrode potential. Two mass transport conditions in the electrolyte are taken into account: (1) finite-length diffusion with constant concentrations of redox species at the distance from the electrode/electrolyte interface; and (2) restricted diffusion with an impermeable boundary condition (zero flux) at the distance from the interface. (v) both redox species and have the same initial concentrations and same diffusion coefficients. Dimensionless quantities are defined for all variables/parameters; that is, the distance from the interface , the time variable , the interfacial concentration , the angular frequency of sinusoidal signal , its amplitude and the diffusion impedance . Here denotes the initial concentration, is the diffusion coefficient, is the diffusion resistance and is the Nernst constant, with , and having their usual meanings. Of course, semi-infinite diffusion conditions can be recovered at high frequencies, typically at , irrespective of the permeable or impermeable boundary at . General rules for computing the species concentration versus distance and time are given in . C. Montella, J.-P. Diard and B. Le Gorrec, Exercices de cinétique électrochimique : II. Méthode d&CloseCurlyQuote;impédance, Paris: Éditions Hermann, 2005 pp. 237. Claude Montella and Jean-Paul Diard "Concentration Profiles in Electrochemical Impedance Spectroscopy (EIS)"